After millions took to the streets to topple Mohamed Morsi and Al-Sisi made his declaration removing Morsi from the presidency, there has been widespread debate about how to characterize these events. Was this a revolution of the masses, or a military coup aimed at removing the president in order to establish a military dictatorship? The answer to the question "Revolution or coup?" 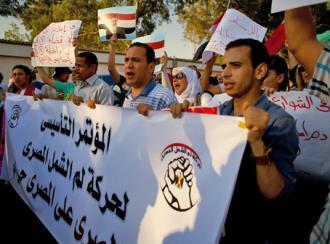 is crucial to the development of a strategy for the coming months--and perhaps years--of the Egyptian revolution. Whoever dismisses the intervention of the gigantic mass movement that launched the new wave of the Egyptian revolution is fleeing from dealing with its inherent contradictions, and thus from the new challenges confronting the Egyptian revolution, as well as the opportunities that the future holds. Unsurprisingly, the revolutionaries who dismiss the value of the intervention of the masses--or at least consider the masses to be simply the object of a counter-revolutionary game--are suffering today from deep frustration as a result of what they call the "retreat" or "end" of the Egyptian revolution, and their denial of the available opportunities. Nor are they alone in dismissing the direct intervention of the masses in Morsi's downfall, and the downfall of the legitimacy of the ballot box with him. Almost all the forces intervening in the political situation today, including international forces, dismiss the role of the masses. The exception here is the military establishment, which was burnt by the fire of the mass movement previously and thus was unable to ignore or overlook it. Rather, the prospects and development of the mass movement are the principal factor determining the military's policies and interventions. The military establishment represents the mainstay of the ruling class, the regime and the state. It is the spearhead of the counter-revolution that imposes itself on the mass movement as a fait accompli, even while it sows panic about the possibility of the development of the mass movement and strives by every possible means to either contain it within a narrow framework that does not threaten its class interests or to directly repress it, as has happened in the past. The army certainly wants to contain the gigantic mass movement demanding Morsi's downfall within the limits it sets and the steps it calculates. It wants to prevent the movement from escaping from the framework of Morsi's downfall lest it become a deeper challenge to the regime in its entirety. The primary goal of the military was to send the millions who filled and controlled the streets back to their homes in the shortest possible time, and to stop the movement at the limit of overthrowing the head of the regime and getting rid of him. This goal was compatible with the aspirations of the military after Morsi's failure to abort the revolution, given the confusion that had gripped the ruling class due to the ongoing revolution throughout his year in office. After Morsi's rise to power last year--with the blessing of the U.S., the military establishment and a large section of the business elite--he nevertheless failed to achieve the objectives of the ruling class in aborting the Egyptian revolution. Morsi was initially a better option for the majority of the ruling class, as he adopted the neoliberal project and aligned himself with the interests of business. He had no qualms about an alliance with the U.S. and was careful not to disturb the Zionist state, in addition to being the first elected president after the revolution. Most importantly, Morsi had a base in the largest mass organization in Egypt, an organization that works on the ground with hundreds of thousands of members, sympathizers and supporters. They would be able to absorb the anger of the people and convince the masses of the neoliberal project and the cruel plans for austerity that accompany it, thus sparing the ruling class the danger of a mass uprising during its attempts to deal with the economic crisis--or at least to mitigate its effects--at their expense. Instead, the economic crisis and the failure of Morsi to implement the demands of the revolution (or more accurately his explicit challenge to these demands and objectives) led to a decline in his popularity and the popularity of his organization--to the extent that the ruling class and its institutions could no longer rely on them in the face of the masses. When it became clear that popular anger had risen enough to overthrow Morsi, it became necessary for the most powerful and cohesive institution in the ruling class--the military--to intervene quickly to contain the anger of the masses and implement their demand. It was necessary to get out of a losing bet on the head of the regime and to rearrange and unify the ruling class around new leaders who would appear as heroes, carrying out the people's demands and uniting with the people in "one rank." The army was really caught between two fires. The first was the fire of the mass movement, and the possibility of it breaking through its limits in the event of Morsi continuing in power. The second was the fire of the Brotherhood and the Islamists in the streets--and with the opening of complex fronts in Sinai to a greater extent and some areas of Upper Egypt to a lesser extent--in the event of Morsi's overthrow. Not to mention the differences that would develop with the U.S. administration and the threat of what they call "the democratic path." The army chose to avoid the fire of the mass movement, despite the consequences. It decided to knock out Morsi, while absorbing the masses and stopping the development of their movement, and face the fire from the Brotherhood, which was less threatening than that of the masses. As for the U.S. administration and to a lesser extent the EU, they have long-term strategic relations with the Egyptian military establishment that are capable of absorbing any tensions caused by the overthrow of Morsi. Thus the military panicked about the possibility of the explosion of the mass movement and its escape from its leash. But the other option was also fraught with danger, for if the army did not overthrow Morsi, and the movement developed in a more radical and deeper direction, the confidence of wide sections of the masses in the army--a confidence which was born out of the absence of any other alternative that could deal decisively with Morsi--would be shaken. This was a factor that could push the movement off its tracks. In order to complete the work of containing the mass movement, the military appointed an interim president and a new government as a civilian face. The aim was to preserve firstly all its powers and privileges and its interventionist role in violent repression when necessary. Secondly, it aimed to complete the project of counter-revolution at both a political and economic level. This did not mean a retreat of the military from power, but rather the opposite. For in spite of the military's retreat behind the civilian cloak of the new government, it still manages everything just as it did during the year and a half of the Military Council under the leadership of [Field-Marshal] Tantawi and [General] Anan. So we witnessed the mass wave of protest on June 30 and the few days that followed, and we've seen the military riding on the revolution after July 3 in order to block the further development of the mass movement. The mass movement could have developed greater and more radical dimensions, in particular with the beginning of partial strikes in the Public Transport Authority, the railways, in Mahalla, and among the civil servants at the Cabinet Offices and many others. We are also seeing the return of the ruling class with its military symbols and old leaders in full force, after the expulsion of the Brotherhood from the state, in order for the military to lead the ruling class and the forces of counter-revolution to achieve what Morsi failed to do. That is, to abort the revolution and a hugely confident mass movement, which was however full of contradictions in consciousness and organization. Inevitably, we have to deal with the movement, including its contradictions, and exploit the possibilities inherent in it to prepare for the stronger waves of the Egyptian revolution to come. From this perspective, February 11, 2011 [the day Mubarak was forced out], does not exactly resemble July 3, 2013, and is in fact completely unlike it in many respects. In the first case, the ruling class was forced to get rid of the head of state, thus opening the door to greater confusion within its own ranks. The state was in a condition of much greater weakness than it appears today, after the collapse of the Interior Ministry and the extreme hostility to Mubarak's cronies. In the second case, however, the ruling class got rid of the head of the regime in order to unite its own ranks, shuffle the cards in its hand, and mend the cracks in order to prepare for attacks on all revolutionary movements. But this does not mean that the political and economic crisis of the ruling class has ended. In the face of Morsi's overthrow, the Brotherhood and their Islamist allies sought to escalate their mobilization on the ground with sit-ins and marches in order to restore the "legitimacy" overthrown by the masses. In the process, they have committed heinous crimes in many areas and provinces that cannot be forgiven while using their sectarian rhetoric and incitement against Christians, pouring their anger out on them and attacking churches. As Revolutionary Socialists, we must stand firmly against this aggression and any attack on the Christians of Egypt: this is a matter of principle for us. We are well aware that for the Brotherhood this is a battle for survival, and they will not easily surrender. In parallel to the Brotherhood's attacks and crimes, they themselves are facing violent repression at the hands of the military and the Interior Ministry, beginning with the massacre at the Republican Guards HQ and ending with the barbaric breaking-up of the protest camps in al-Nahda Square and Raba'a al-Adwiyya, not to mention the killing of three of their female members in Mansoura, and so on. The crimes of the Brotherhood have led most factions of the left to take an extremely opportunistic stance and to ally themselves with the military in support of the repressive state, even repeating the same lies of the bourgeois and feloul [remnants of the old regime] media, completely abandoning any revolutionary or class position. This perspective is built on a catastrophic analysis that considers the Muslim Brotherhood and its allies to be the greatest danger to the Egyptian Revolution, while in reality, if the Brotherhood poses a danger to a certain extent, the institutions of the state that monopolize the means of violence represent a far greater danger to the revolution. This is manifested in the return of the repressive state in all its brutality, in the dictatorial Constitutional Declaration, in the appointments of provincial governors drawn from military generals, police and the old regime, and the attack on the Suez Steel strikers and so on. In addition to the opportunistic and treacherous position of so-called liberals and leftists in support of the military (led by those who participated in Al-Sisi's government), there are many who see the battle between the Brotherhood and the new/old regime as a battle that means nothing to the revolution--as if the revolution has no stake in its outcome. From this perspective, revolutionaries must take a neutral position, as if the two parties to the conflict are of equal strength and represent the same danger to the revolution. These views are extremely shortsighted. They do not see the real meaning of the current regime's actions--and the grin on the military's face as they crush the sit-ins at Raba'a al-Adawiyya and al-Nahda. These massacres are a dress rehearsal for crushing the Egyptian Revolution and will be repeated tomorrow against any genuine opposition force that appears on the scene, particularly the labor movement. This is what we saw a glimpse of in the attack on the Suez Steel strike. The massacres against the Islamists are only the first steps along the road towards counter-revolution, and we must expose this in sharp and principled attacks on them. Today we are subjected to a great deal of criticism of our position condemning the violence of the institutions of repression against the Islamists and for our attacks on Al-Sisi as the leader of the counter-revolution. But this will not lead us to dilute our position by creating a kind of "balance" in our attacks on the military and the Islamists, as if there were equality between them in terms of the danger they represent to the revolution. We are in the process of a comprehensive and sweeping counter-revolution, and the crushing of the Muslim Brotherhood's sit-ins and protests is only the first step. We will not waver in our firm position against the military and its fierce repression. "Balance" between the two sides would only reflect hesitancy and indecision instead of taking clear and bold position against the repressive state. We cannot be silent about the military's massacres that have killed dozens of Islamists, and we cannot support the state in crushing their sit-ins. Nor can we stop recalling the military's crimes, issuing warnings about the Interior Ministry, and demanding the prosecution of their criminals at every opportunity. Likewise we must warn of the return of Mubarak's state and its repressive institutions in full force and direct our attacks against it. Nor must we be drawn behind the attempts of the supporters of the old regime and their thugs to harass the Islamists and kill them in the streets. There is a vast difference between the self-defense of the masses--even if by violent means--in the face of attacks by the Brotherhood, as we saw in Manial and Bayn al-Sayarat and Giza a few weeks ago, and the violence of the institutions of repression and the thugs of the old regime against the Muslim Brotherhood. The latter is not violence defending demonstrators and the revolution, but rather an attempt to stabilize things in the hands of the new regime without opposition from any quarter. The army, police and old regime elements did not intervene, not even once, during the last few weeks, to protect local people or protesters in any of the clashes. It is in this context that the Tamarod (Rebel) movement and the left, which is stuck to the military's boots, is calling for popular committees to protect the state and the institutions of repression and to help them crush the Islamists. These are fascist calls, and we cannot accept them or repeat them. We must confront the lies in the media that give political cover by pinning all the crimes of the military and the old regime on the Muslim Brotherhood. We must challenge the obnoxious narrative that seeks to erase the revolution of January 25 and replace it with the June 30 revolution, in which "all classes" participated and which was not about "burning police stations" and "attacking institutions." This narrative presents the January Revolution as purely a conspiracy of the Brotherhood, which required a revolution against them, and not a revolution against the ruling class and its state and repressive institutions. In addition, we hear hateful racist rhetoric against the Palestinians and the Syrians. The state is mobilizing almost all political forces and (formerly) revolutionary forces behind it, as well as large sections of the masses, in order to confront the Muslim Brotherhood and the Islamist alliance around them. In what they call the "war on terror," they are whipping up a disgusting nationalistic atmosphere, claiming that "there is no sound louder than the sound of battle" in order to suppress and garble the demands of the revolution. As for the talk of "exclusion" [from the political process] and "reconciliation," the Revolutionary Socialists cannot build their position on this issue in isolation from the moods of the masses and their orientations--in spite of their strong internal contradictions. These masses will not accept reconciliation with the Muslim Brotherhood. As one of the statements of our movement put it, "beating the drum for reconciliation suggests equality between murderer and victim, which is completely unacceptable, without bringing the killers of the martyrs, all the martyrs, and the instigators of violence, to a fair trial." If the masses, under the influence of the media and bourgeois propaganda, want to exclude the Brotherhood, while ignoring the old regime elements and the military, we must also attack the return of the old regime supporters and the return of Mubarak's state under Al-Sisi's flag. All of them are enemies of the Egyptian Revolution and its future prospects, and Al-Sisi is much more dangerous than [Muslim Brotherhood leader] Muhammed al-Beltagi by any measure. In these circumstances, we must directly and boldly and clearly and without any hesitation raise the slogan, "Down with military rule, no to the return of the feloul, no to the return of the Muslim Brotherhood". Are we afraid of isolation? There is no doubt that the tactics of Revolutionary Socialism depend fundamentally on determining the level of development of the consciousness of the masses--and of the working class at their heart and their vanguard--on the one hand, while assessing the possibilities and opportunities for the development and deepening of the mass movement during the course of the revolution on the other. The mass movement today suffers from great contradictions within it and faces great challenges, and perhaps the greatest of these is the apparent reconciliation between a section of the masses with the institutions of the state, and particularly the military and the Interior Ministry, the head and heart of the counter revolution. Yet despite the massive frustration that affects large sections of revolutionaries who fought against the Military Council during a year and a half of the revolution (and who continued their struggle against Morsi's regime), there is no other way to carry out a vital role within a mass movement, except to deal with it as it is and to understand its contradictions without either overlooking or exaggerating its current potential. The alliance of the old regime elements and the liberal media with the security services, the military and the Interior Ministry has succeeded to a large extent in swaying the masses by projecting a false image of the neutrality of the military and the Interior Ministry, which they portray as being aligned with the people against Morsi, the Brotherhood and their Islamist allies, in an attempt to also erase the crimes of the state in murder and torture from the memory of the masses. Many political forces, most notably the opportunistic National Salvation Front, the Tamarod campaign, and the Popular Current, have played the most opportunistic and dirty roles in burnishing this image through calls for "unity in the ranks." They praise the national role of the army and the state institutions in meeting the demands of the people to finish with the Brotherhood regime, which they considered to be the biggest and only danger to the Egyptian revolution. However, this perspective only represents a thin crust around the consciousness of the masses. True, it is a solid crust, and almost all parties are working to harden it further, but underneath lies a genuine consciousness of the demands of the revolution and its goals of bread, freedom and social justice. We cannot lose sight of the fact that, in the midst of these contradictions in consciousness, large sections of the masses have great self-confidence, despite all the distractions and the fog of the "war on terror." The masses have genuinely imposed their will and overthrown two presidents and four governments since the beginning of the revolution. This confidence, which lies under the crust of contradictory consciousness, is what prompted the masses to rise up against Morsi in the first place, and it is this which allows some to prepare gradually to complete the struggle against the new government, as its economic and political policies opposed to the demands of the masses becomes progressively clear. This is despite the partial hope among some sectors of the masses that the government will meet the demands of the revolution. At this stage, we have to find every way possible to reach the genuine core of the poor and working masses' consciousness, in whose fundamental interests it is to continue the revolution and implement its demands. We must continue to emphasize the giant capabilities that the masses exhibited during the June 30 uprising and during the previous waves of the revolution by spreading the genuine demands of the Egyptian revolution and mobilizing for them in every province and every workplace. But this cannot and should not push us to hide or delay some of our policies and principles in order to enjoy the temporary, close support of the masses behind our rhetoric and our slogans. On the contrary, concealing some of our slogans or our policies in order to achieve short-term political goals will only lead to opportunism. This is not the way that the Revolutionary Socialists work, and we have completely avoided opportunism as we have built our organizational project in the midst of the masses and for the victory of the Egyptian Revolution. For example, we cannot slacken in our attacks on the lies presented by the media of the old regime and the bourgeois liberals, or stop our attacks on the rehearsals for counter-revolution that the military and the Interior Ministry are carrying out today. We cannot stop recalling the criminal history of the Military Council and Mubarak's cronies and demanding that they be put on trial side-by-side with the Brotherhood's leaders who have excelled during the last few weeks in incitement to violence and killing and the unleashing of disgusting sectarianism. We cannot, in any event, slacken in directing political attacks against the old regime elements and the opportunists in Beblawi's government, the clear liberal tendencies of this government, and the consolidation of the repressive state by the appointment of new provincial governors. We cannot relent in our attacks on the huge powers and privileges that the military enjoys under the constitution, its control of roughly 25 percent of the Egyptian economy, the continuation of the humiliating Camp David agreement and so on. We have to deal with these things in a strictly principled manner. Belittling the return of Mubarak's state and military repression is extremely dangerous. The state of Mubarak, which--it is true--did not disappear from the scene since the beginning of the revolution, returns today with its full powers, free of internal crises, and with the support of wide sections of the masses. It is this situation that forces us to go on the attack immediately against this state and its symbols; the state will not wait long before launching attacks on all who call for the demands of the revolution. Our principled position may result in our temporary isolation in the midst of the masses. Our message will not generally find a wide reception in the masses, despite all the efforts we will expend in work and activity in the workplaces, the university campuses and the local neighborhoods. This isolation had already begun in reality before June 30, as a result of our principled position against the military, the old regime and the Brotherhood. But we must not allow ourselves to give into any degree of frustration, for as long as contradictions continue in the consciousness and capacity of the masses to organize themselves, the mass movement will remain a vehicle that can be affected by many intersecting factors, which compel it to proceed along winding roads and not constantly along a straight and rising path. The real content of the repressive regime now in power will be revealed before the eyes of the masses, and they will gradually begin the struggle against it. This does not mean complete isolation and separation from the masses, as there are tens of thousands of revolutionary youths who fought fiercely against military rule in the waves of the Egyptian revolution, and who completed the struggle against Morsi's regime. Their memories are still rooted in revolutionary principles, they have fewer contradictions in their consciousness, and they are not betting on the institutions of the state,particularly not on the military, the backbone of the counter-revolution. These will find the principled position of the Revolutionary Socialists attractive,in the light of the wholesale drift of the political forces to the side of themilitary and the new government it has appointed. From this angle, the situation is better than it was after February 11 2011, when for months, only the Revolutionary Socialists and few individual activists would speak out against the Military Council. In the weeks and months to come, we have the opportunity to attract and win some of these revolutionaries to strengthen our ranks, in orderplay a more vibrant and stable role in the coming waves of the revolution. But at the same time we also want to integrate workers and the poor who made the revolution and participated in the last wave of 30 June for the goals of the revolution which were never realised. Here it is of the utmost importance to revive the project of the Revolutionary Front with principled parties which do not drift into the arms of the state and the new government, neither are they allied with the Islamists against the state and which adopt a programme of the demands of the revolution and its goals.